As part of College Awareness Month in October, LA Unified officials on Tuesday presented a new initiative designed to inspire and prepare the district’s students for college, starting at the pre-K and kindergarten level and continuing every year through 12th grade. “The Division of Instruction wanted to begin a dialogue of specific activities by grade level, highlighting an activity by grade level that every child by grade level would have,” Carol Alexander, director of LA Unified’s A-G Intervention and Support, told the school board’s Curriculum, Instruction and Educational Equity Committee. The plan is one of several ways the district is looking to increase college awareness this month. Others include a new instructional video on the A through G graduation standards, which will be shown to students, and a personalized brochure that can be given to high school students on A-G in their native language. The district is also promoting upcoming college fairs, as well as partnering with Cash for College on upcoming workshops for parents and students on how to apply for financial aid. The pre-K through 12th-grade plan isn’t required for schools but is a list of “suggested activities” that have been sent out to each school, Alexander said, and leaders at each site will decide how best to implement them. The activities include kindergarten students investigating and learning about different careers, researching a college or university in 5th grade, learning about the A-G course requirements and how to calculate their GPA in 8th grade and writing college essays in 10th grade. Members of the school board on the committee reacted positively to the overall plan and added some suggestions of their own on how to get the district’s kids interested in and ready for college. Alexander also played a six-minute video produced by the district about the A-G graduation requirements that will be shown to students. The standards, which were required for graduation for the first time last school year, call on students to take and pass a series of courses that would make them eligible for admission to California’s public universities if they earn all C grades or better, although D’s are allowed for graduation. The video featured a series of graphics and a voiceover highlighting the various classes students need to pass to qualify for graduation. Board President Steve Zimmer offered what he called a “gentle critique” when he said the video could perhaps use a little more excitement. “As I was watching the video, I was reminded a little bit and it felt a little bit like I was strapped into my airplane seat and I was watching the safety video of like — very important information, but I’m worried that people kind of tune it out,” Zimmer said. 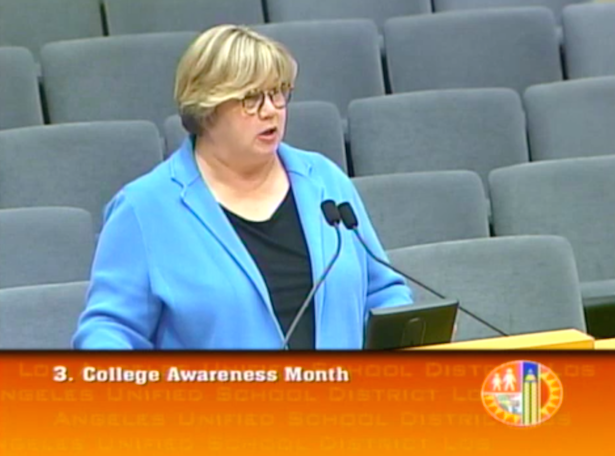 College and Career Awareness month comes as the district enters the second year of its new A-G standards, and with the recent news that LA Unified broke its graduation record last school year. It also comes on the heels of the August announcement of the Los Angeles College Promise, in which every district graduate starting in 2017 will be offered a free year of tuition at any Los Angeles Community College District campus.